Today, businesses with green interests are valued over others because by now everyone has realized that environment friendliness is an important factor. 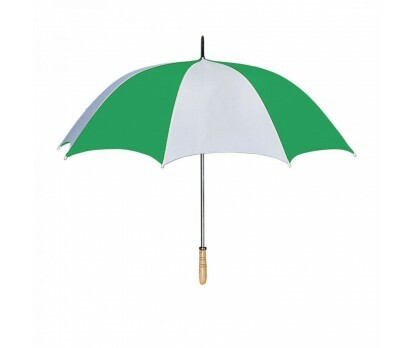 Personalized white & green 60” arc golf umbrellas are becoming hot promotional choice for marketers because it reflects their business interests and highlights their participation in green business practices. Features - white and green 60” arc canopy, sturdy metal shaft and wooden handle. Imprint area - 10" W x 6" H. This umbrella can be employed for marketing during golf matches and green exhibitions.